This Peppermint Hot Chocolate Cookie Cups recipe has chocolate cookie cups filled with peppermint ganache and a candy cane handle topped with crushed candy canes and mini marshmallows. Two years ago I shared my Hot Chocolate Cookie Cups recipe and it continues to not only be a reader favorite but it is also a family favorite! Last year I made a large batch for my husband to give to his clients and they loved them. 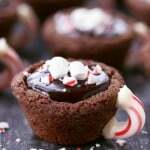 This year I am excited to share this recipe for Peppermint Hot Chocolate Cookie Cups. These cookies have a chocolate cookie cup, peppermint hot chocolate ganache, a candy cane handle, and sprinkles of crushed candy canes and mini marshmallows on top. They are almost too cute to eat! Disclaimer: Please note that some of the links below are affiliate links and I will earn a commission if you purchase through those links. Thank you for your support! 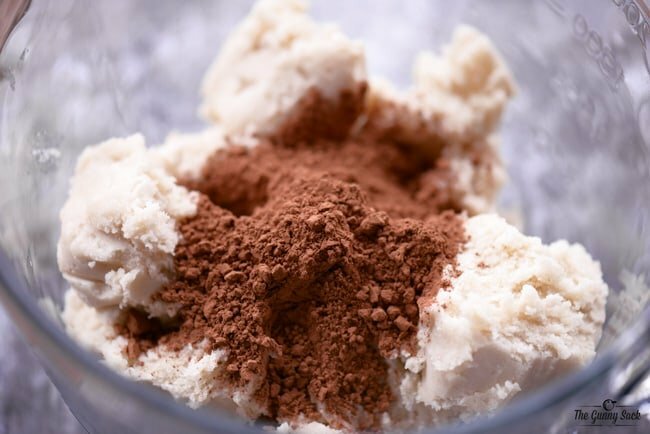 Break one tube of Pillsbury refrigerated sugar cookie dough into a large bowl, add unsweetened baking cocoa and mix well. If you prefer to use homemade sugar cookie or chocolate cookie dough, that works too. I’ve had great success using the Pillsbury sugar cookie dough so that is what I continue to use. Scoop level tablespoons of the dough, roll into balls, coat in sugar and bake in a well greased mini muffin pan. Allow the cookie cups to cool before removing them from the pan. 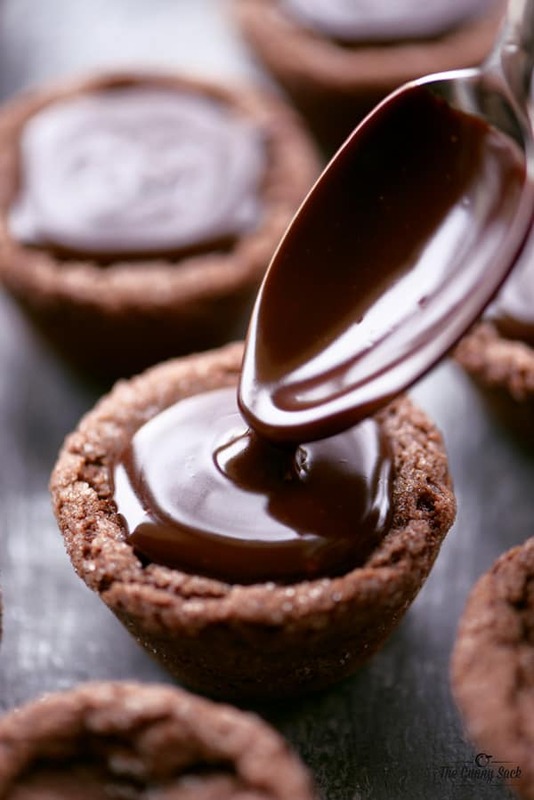 As the cookie cups cool, they will naturally fall in the center making a small well for the ganache. I didn’t do anything to make the well larger since the ganache is very rich and you only need a small amount. 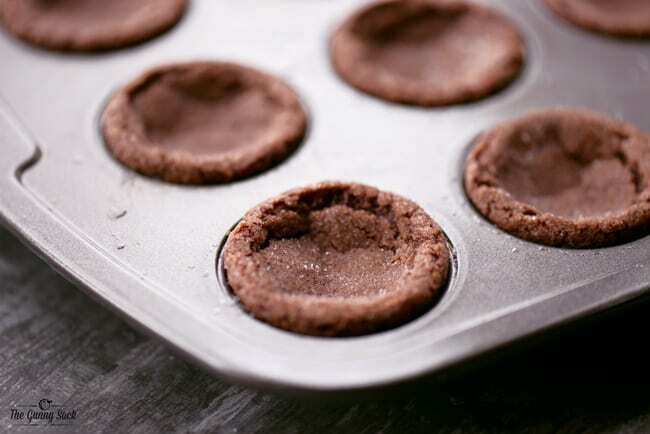 Some of my readers reported issues with their cookie cups sticking to their mini muffin pan. So, I also tested my silicon mini muffin pan and it works great. I use a Grazia Silicone 24-Cup Mini Muffin Pan. 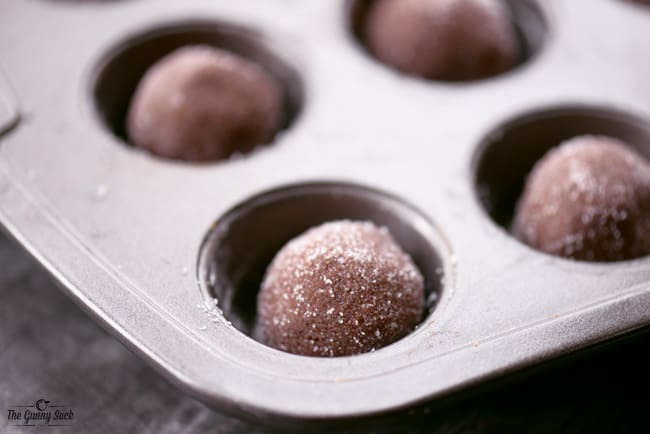 If you do go with a silicone mini muffin pan, follow the same instructions as above rolling balls of dough, coating it in sugar, greasing the pan, baking, and cooling. I do prefer the metal non-stick pan slightly over the silicone pan because the cookie cups are a little taller which gave me more room for attaching the candy cane handle. 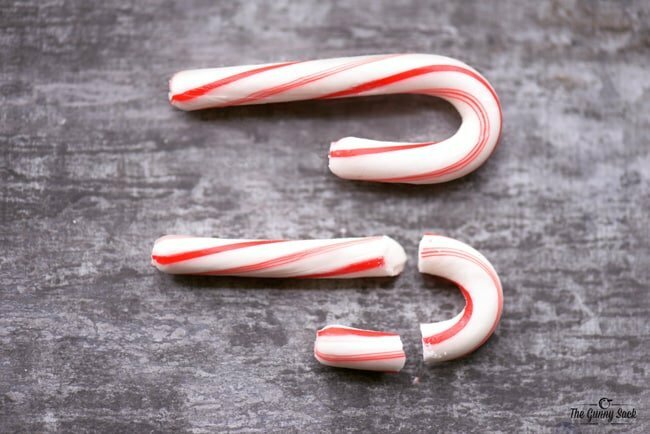 Make candy cane handles by breaking or cutting off the curved part of mini candy canes. I ended up doing a combination of both. This step was harder than I thought is was going to be and several of the candy canes crumbled. Save the remaining pieces for crushing or for other baking. If you are having issues with this step, I would suggest using pretzel handles like I did in the original Hot Chocolate Cookie Cups instead or you can skip the handle completely! Once you have all the curved handles, melt white chocolate chips in the microwave, dip the ends of the candy cane handle in the melted chocolate, press against the side of the cookie cup and hold until it stays in place. This is very time-consuming! I held each one in place for 30-60 seconds. If this is too labor intensive, I suggest enjoying the peppermint hot chocolate cookie cups without the handles. Make the peppermint ganache using heavy cream, semi-sweet chocolate chips, and peppermint extract. Spoon the peppermint ganache into the cookie cups. Add a sprinkle of crushed candy canes and Jet-Puffed Mallow Bits (which are tiny crunchy marshmallows). 1. Is it possible to make these cookie cups be made ahead of time? Yes, they can be made ahead of time and stored in an airtight container in the fridge or the freezer. 2. Can I use brownie mix instead of cookie dough? To make brownies in a mini muffin pan, prepare the brownie batter as instructed on the package. Add one tablespoon of batter to each greased mini muffin pan cup. Bake at 350˚K for 12-15 minutes. 3. How do I prevent my cookie cups from sticking to the pan? Rolling the cookie dough balls in sugar helps as does greasing the pan. Also, baking the cookie cups in a silicone pan is a great option. Or use a good, non-stick mini muffin pan. 4. What should I do if the cookie cups are stuck in my pan? Allow the cookie cups to cool completely. Then, use a thin, flexible knife to pry up the edges of the cookie cup and run the knife along the edge of the cookie cups. 5. 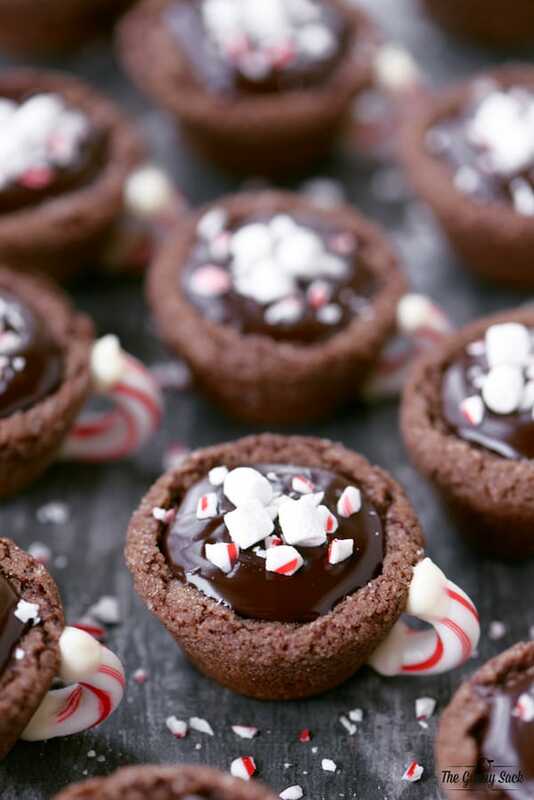 Will the chocolate peppermint ganache run out of the cookie cups when you take a bite? No, once the ganache has cooled in the fridge it is more fudge-like and will not spill out. You can see an example of what the inside will look in the original hot chocolate cookie cup above. Want More Cookie Cups Recipes? We’ve Got You Covered! 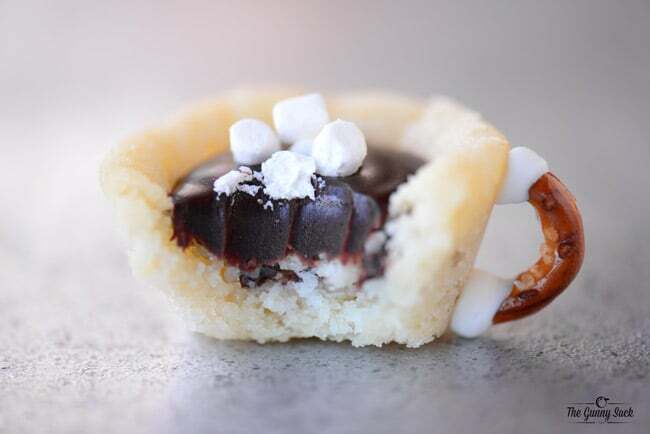 Hot Chocolate Cookie Cups: These ORIGINAL Hot Chocolate Cookie Cups made with sugar cookie dough are filled with hot chocolate ganache, have a pretzel handle and mini marshmallows on top! Red Velvet Hot Chocolate Cookie Cups: Red Velvet Hot Chocolate Cookie Cups recipe with red velvet cookie cups, chocolate ganache, a pretzel handle, and mini marshmallows. Flower Pot Cookie Cups: These Flower Pot Cookie Cups have sugar cookie cups, chocolate ganache, and Oreo dirt, they are as good to eat as they cute to look at. Easter Basket Cookie Cups: These adorable Easter Basket Cookie Cups are almost too fun to eat! An Easter dessert recipe filled with buttercream frosting, chocolate bunnies, and chocolate eggs. Eggnog Cookie Cups: Eggnog Cookie Cups are sugar cookie cups filled with eggnog ganache. This edible craft idea is an easy eggnog recipe that is perfect for Christmas. Peppermint Hot Chocolate Cookie Cups are chocolate cookie cups filled with peppermint ganache and a candy cane handle topped with mini marshmallows. Break the sugar cookie dough put in a large bowl. Add the unsweetened cocoa and mix well. Scoop level tablespoons of the dough, roll into balls, and coat in granulated sugar. Bake in a well greased mini muffin pan for 11-13 minutes. Allow the cookie cups to cool before removing them from the pan. Bring the heavy cream just to a boil in the microwave and then mix in the powdered hot chocolate mix. Add the semi-sweet chocolate chips. Let sit for about 3 minutes and then stir until smooth. Mix in the peppermint extract. Top with crushed candy canes and mini marshmallows. Instead of adding 2 tbsp I added 1 1/2 then added 1/2 of ground peppermint and it was fabulous! 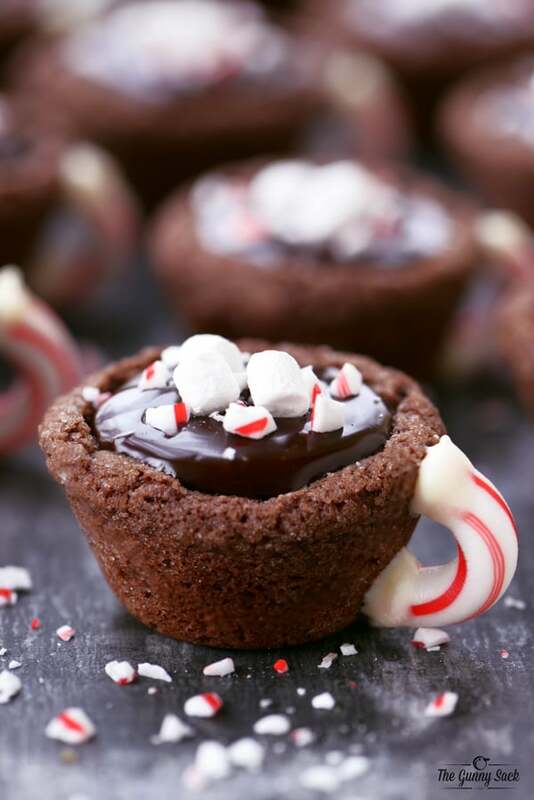 Absolutely love your creative idea with peppermint hot chocolate cookie cups! Never seen something like this! Definitely I will try to make them too! Thx for sharing! I am obsessed with desserts !What a fabulous recipe and blogger feature! Those peppermint hot chocolate cookie cups are killin’ me. Thanks for sharing, Tonia! Instead of the tube of cookie dough, I used the break apart cookie dough. It was the perfect amount. I just broke apart each square and rolled them into balls. Being Christmas the store was out of peppermint extract so I used chocolate peppermint cookie dough, which was the perfect amount of peppermint taste. So, just started prepping for my Christmas cookie season (I pre-measure and bag all my dry ingredients so I can just pull out the bag and bake!). I wanted to try these, but was worried about the candy cane handles. Tip- use a really sharp ceramic knife! I had no issues cutting any of them to size, and they’re perfect! Can I make these ahead a few weeks? You should be able to if you freeze them after baking them. Best of luck! 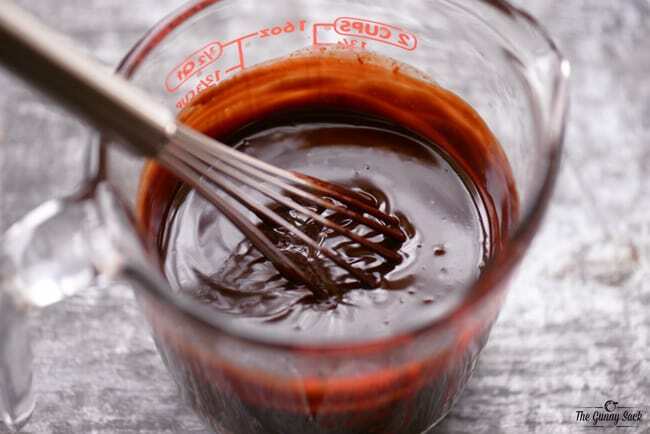 Does the powdered hot chocolate mix go in the ganache? Sorry! I left that part out, didn’t I? Yes, mix it into the hot cream before adding the chocolate chips. THESE ARE ADORABLE! 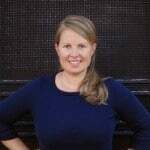 I love that you used the pillsbury dough – makes life so much easier! So, so cute. And how decadent that they are filled with chocolate ganache! Shared! Thanks Julie! The ganache is so amazing! These are like Christmas in a bite! Yum! These are absolutely adorable! And I bet they taste amazing! These are so adorable! I can’t wait to make them and watch the faces of my family when I serve them up! Great idea! Can I use brownie mix instead of the cookie dough?